After working in hospitality, retail, and as an electrician, Andrew Bucknall finally heeded his calling to help others through music. 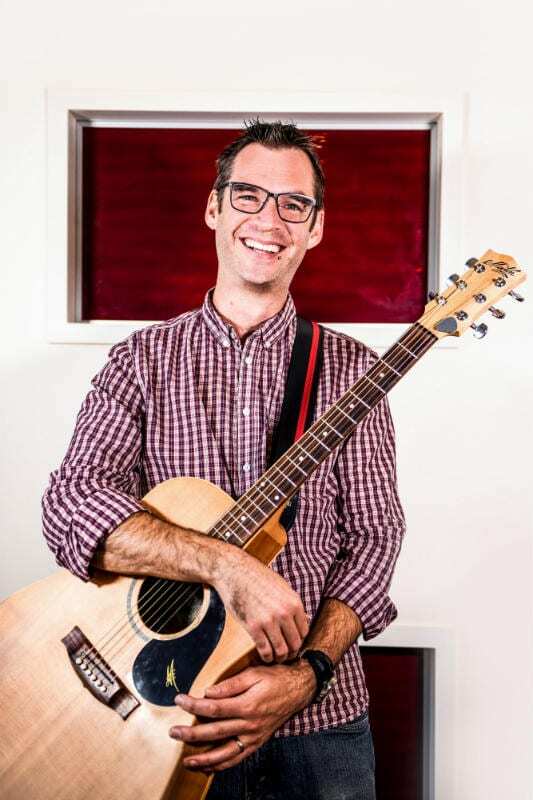 Now a second-year Master of Music Therapy student at the Melbourne Conservatorium of Music, he gives some insight into the course and into the growing world of music therapy. When I finally become a registered music therapist, it will have taken me five years to get there. I completed an advanced diploma in 2003, and then after working as a barista, a retail manager, and even trying out life as a sparky, I decided I wanted to study music therapy in 2012. I saved for a year, then took a few years to complete the units I needed to finish my degree as well as the additional prerequisites for this course, and finally ended up studying at the Conservatorium in 2016. I completed my first year part-time over two years but have now taken on full-time study. My lecturers and supervisors on placement are inspirational. We are so lucky to have some of the most knowledgeable and influential music therapists and researchers to guide us in our coursework. Some literally “wrote the book” (or at least, a book) in their area of expertise. Not only are they a great source of knowledge, but they also challenge us to think independently and to think about carving our own paths in the future. The course is split into lectures on theory and practical workshops. The lectures usually conclude with learning tasks, in which students are able to practise and refine their understanding of the content by sharing their own thoughts. It’s a really valuable part of learning when you can hear other students’ ideas, and then gain further insight and guidance from the professionals. Part of the course and a requirement of applying to be a registered music therapist is completing 640 hours of practical experience in a clinical placement. This offers a great opportunity to experience life as a music therapist in the real world, with support and guidance from a practising clinician. Being thrust into practice on clinical placements – in some cases only weeks into the first semester – can be terrifying. However, with the support of the supervisors, being thrown in the deep end is a little less intimidating – and the feeling of accomplishment after running your own first session ever is amazing. I always knew and felt the power that music has, but I had no idea how effective it could be in helping those in need. The human auditory system can already respond to sound in the womb, and from the very beginning of life – for those born prematurely, for example – music therapists use techniques to pacify and stabilise babies. This, along with many other applications, can help both infants and their families get through difficult times. From birth right through to palliative care, music therapists are able to assist in emotional, developmental, communication and rehabilitative needs during any stage of life. I find that astounding. Master of Music Therapy student Andrew Bucknall. Photo by Giulia McGauran. I was working with a 27-year-old man who had an incomplete spinal injury which had left him unable to walk. By the time he was admitted to the facility in which I was completing one of my placements, he was already able to walk using walking sticks. But by using rhythmic cueing provided by a metronome and my guitar playing, he was better able to coordinate his movement and walked for the longest period of time since his admission. A week later, we worked together in an individual session using the same technique – and this time he was able to walk unaided for the longest time since his admission. Helping him walk was a real highlight for me. My favourite area to work in so far has been in neurorehabilitation, so I am hoping to get a job at a facility that offers that service, or possibly set up a music therapy department in an existing facility. It’s so satisfying being able to see immediate results. The way the Music Therapy course has been set up really prepares us to enter the growing world of music therapy. Being a young profession, it is often up to us to create our own jobs. By completing the placements and learning about ways to approach our upcoming careers, I feel I’ll be well-placed to do so. To people considering a career in music therapy, I’d say: if music and being able to contribute to your community are already areas of passion, then music therapy is the perfect combination. I feel very lucky to have found an area of study and future work in which I will be able to help people in times of need, and play music along the way. When I’m not studying, I love an all-day cook up with great tunes, family, and friends, and of course making my own music when I get the chance. It’s nice to put aside the healing qualities that music has and just enjoy what is such a fun activity! 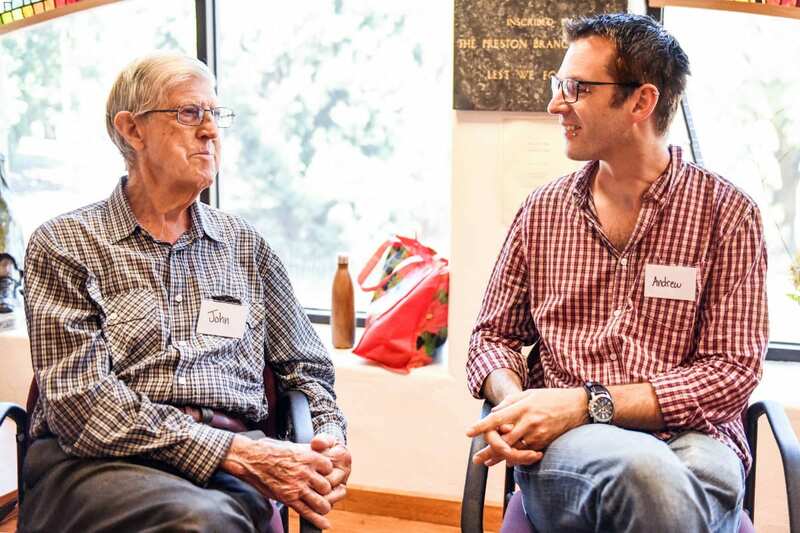 Banner image: Final year Music Therapy student Andrew Bucknell with John, a caregiver for his wife who is living with semantic dementia, at a therapeutic choir session held at the Heidelberg Repatriation Hospital. Photo by Giulia McGauran.